ATCs originated in 1997 when a Swiss artist M. Vanci Stirnemann created an exhibit of over 1,200 handmade cards. He asked others to create cards, as well, so that on the last day of the exhibit he could trade his cards with them. The idea was a hit and turned into a world-wide phenomenon. Today, artist trading cards are used to share work, network, and practice creating on a smaller scale. 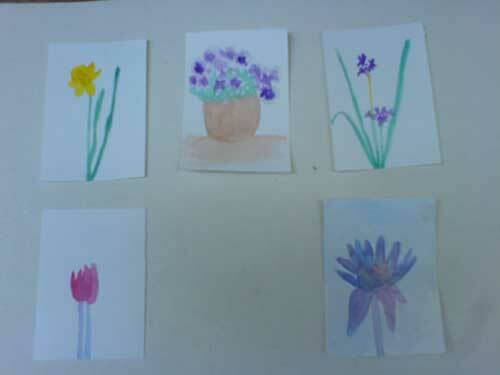 Artist trading cards are pieces of watercolor paper, cardstock, or illustration board that are 2.5"x3.5" in size. An artist creates an original work of art on these tiny canvases and then trades them with other artists through groups and events. Trade is the operative word. Cards should not be sold. Any medium is allowed on trading cards. Some examples of mediums that other artists have used is crayon, wax reserve, collage, gel pens, concrete transfers, watercolor, colored pencil, and pencil sketchings. On the back of the cards, the artist should print their name, contact information (an email address is fine), the title of the work on the artist trading card, and a number if it is part of a series.